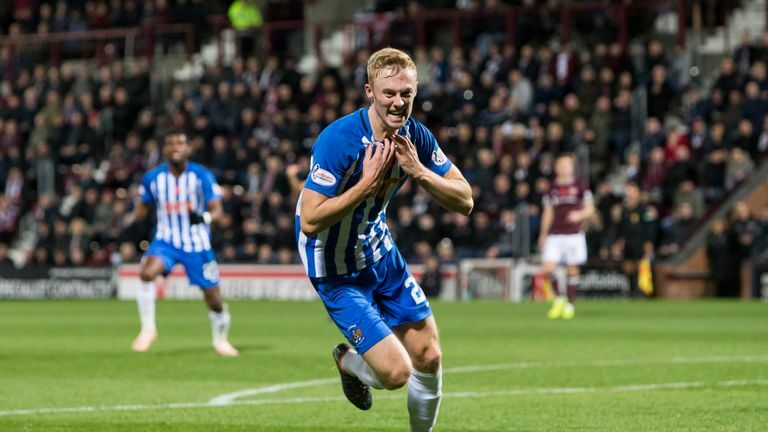 Kilmarnock recorded their first victory at Tynecastle in five years after Ross Millen struck the only goal to see off Hearts 1-0. Steve Clarke's side had spent most of the second half on the back foot before Millen found the net in the 73rd minute. Hearts, who will now be ousted from the Premiership summit for the first time this season if Celtic pick up at least a point at Livingston on Sunday, had looked lively but struggled to create any clear-cut chances. St Johnstone earned themselves a fifth successive Scottish Premiership victory with a comprehensive 4-0 hammering of Hamilton. Murray Davidson got the ball rolling for Saints with his 20th-minute opener and the Perth outfit doubled their advantage by the break courtesy of what seemed to be a Ziggy Gordon own goal. A third from Matt Kennedy just nine minutes into the second period ended any hopes Accies may have harboured of a comeback. Tommy Wright's men remained steadfast at the back to ensure they racked up a fifth clean sheet and added a fourth with 16 minutes left courtesy of a David Wotherspoon tap-in, moving Saints up to fourth. Kenny Miller's first goal for bottom side Dundee gave them a 1-1 Premiership draw against fellow strugglers St Mirren at the Kilmac Stadium. Saints striker Simeon Jackson scored from the spot in the 21st minute before the Dark Blues' skipper, who signed for the Tayside club in August after a short spell as Livingston player/manager, drove in a deserved leveller in the 36th minute. Jim McIntyre's side had the best of the second half as well but could not find a winner, leaving the Dundee boss looking for his first victory after five matches in charge and still at the bottom of the table, a point behind the Paisley side. The Buddies have not won a league game since the opening day of the season and have gone nine games without a win under boss Oran Kearney, and both teams continue their search for form.